"Taking an observation at the pole." 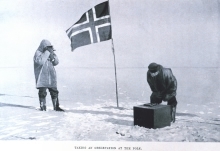 The photo shows a member of the Amundsen expedition (probably Roald Amundsen himself) taking an observation to confirm his achieving the South Pole on December 14, 1911. Seen in the background is the line of the horizon. Most of the journey to the pole and back consisted of crossing a plateau and an ice sheet. Since both were (and are) essentially free of landmarks, navigation was a critical safety factor. To ensure his safe return, Amundsen marked his poleward path with snow cairns at three-mile intervals, each sturdily built and two meters high, one visible from the next. Each contained a record of its position, the distance to the last supply depot, and the bearing to the previous cairn. In this way, to reach the next depot on his return, he did not have to rely on the weather being clear enough for a sun sighting. In case somehow he missed his trail, he marked his depots with flags, across his path, spaced every half-mile, each flag numbered and bearing a record of the distance and bearing to the depot. His dogs also left behind a trail of spoor, which, being dark in color, stood out against the ice and snow, marking the trail for the return trip. All of these measures comprised Amundsen's approach to mitigating navigational risk on his return. They protected him against inability to sight the sun, against compass loss or failure, against whiteout, and against wind-driven erasure of his tracks. Moreover, these measures, taken together, were either non-interacting or only weakly interacting. It was a fiendishly clever design. Photo by Steve Nicklas, NOS, NGS. Courtesy U.S. National Oceanic and Atmospheric Administration. The photo originally appeared in The South Pole: an account of the Norwegian Antarctic expedition in the "Fram," 1910-12 , by Roald Amundsen. Volume 2: p. 112. In Part I of this two-part series, we examined the organizational and political risks of risk management plans and processes. Now we turn to the risks that arise from change and from the interactions between risks. Risk is a dynamic attribute of projects. Even if a project were frozen in place, its risk probabilities and risk impacts could change, because its environment changes. It's necessary to review risk plans with a frequency compatible with the volatility of the risk environment, which is itself difficult to estimate. Indicators of risk dynamics risk include risk plans that remain unchanged for long periods of time; budgets and schedules that omit risk reviews or perhaps schedule them infrequently; and retrospectives that don't address risk review. If these indicators are present, risk dynamics risk is also likely present. Risk interactions within a given project are especially problematic. Two risks might seem independent, but the probability of one occurring might change if the other materializes; or the response to one risk might alter the consequences of or the probabilities of materialization of others; or the response to one risk might limit the project's ability to respond to another. For instance, if Arthur is backup for both Tory and Chris, all's well, as long as either Tory or Chris is available. If both become unavailable, we have trouble. The method known as morphological analysis developed by Fritz Zwicky, is useful for uncovering intra-project risk interactions. In this method, you examine all pairs of risks and ask, "If both risks materialize, will our planned responses still be effective?" If you find that the answer is "no," you can revise your plan. You can generalize this procedure to triples of risks, quadruples, and so on. For more on morphological analysis, see the article by Tom Ritchie at the Web site of the Swedish Morphological Society. Or take your pick from hundreds of sources. An inter-project risk interaction occurs when conditions in a given project change risk probabilities in another project, or cause risks to materialize in another project. Chris is availablesuppose two projects are scheduled to use the same resource serially. If the first project is delayed, the availability to the second project of that same resource changes. At the time of development of the risk plan of the second project, knowledge about the strategies and risks of the first would have been useful, but such information, sadly, is rarely shared. To limit inter-project risk interaction risk, coordinate risk reviews with projects likely to transmit risk back and forth. If the risk profile of one of the projects changes, there is enhanced probability of impact on the other. Would you like to see your comments posted here? rbrenSstmXiAVtfNAOujQner@ChacTuGQqqrCVSNSQxQSoCanyon.comSend me your comments by email, or by Web form. I offer email and telephone coaching at both corporate and individual rates. Contact Rick for details at rbrenmGnMpiioCmXxqHOVner@ChacycYJDzRDzqNppQZnoCanyon.com or (650) 787-6475, or toll-free in the continental US at (866) 378-5470.